As I get into the cab at the Exuma Market, right next to the dinghy dock, I notice that the driver is already halfway through his first Kalik of the day. It is 10:30 a.m. At least he was right on time - in fact, he was waiting for me when I got there. Maybe an early morning beer dispels the usual "island time" ethos of the Bahamas. 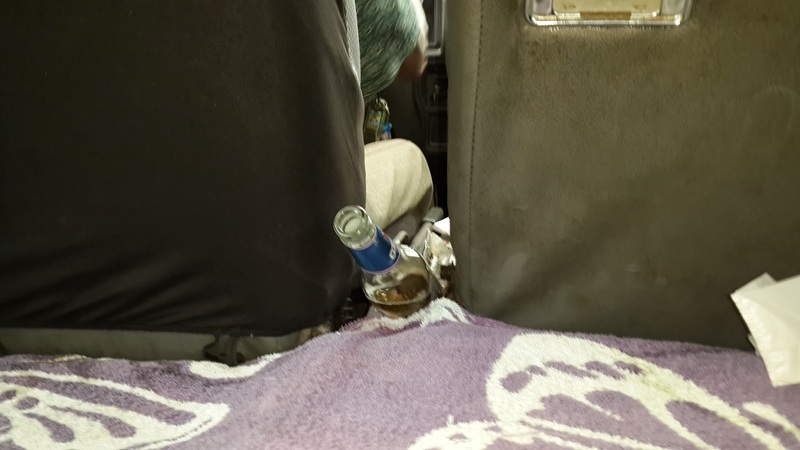 If your cab driver doesn't spill his beer, I think that means he is still safe to drive. As we drive to the airport, I keep looking out across the water to see if I can see Sara making her way back across the heavy chop to Monashee. It is a pretty stormy day, and if I didn't have to catch a plane, we would have stayed on the boat. I can't see her, but she texts me right as I arrive at the airport to say she made it OK. The Christmas carols playing over the PA system in the Miami airport seem out of sync with everything around me, and make me smile to myself as I walk down the halls, with the sun streaming in through the windows. When I get to Calgary, though, the Christmas carols and Christmas trees don't seem out of place at all. 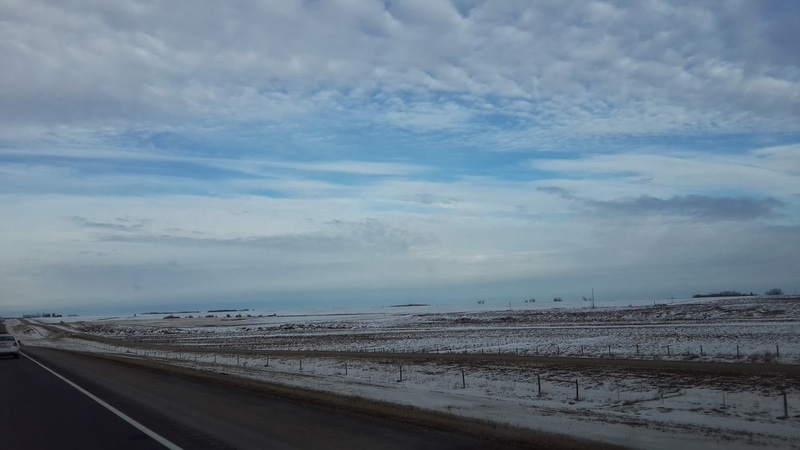 Mercifully, it is still +2 degrees as the remains of a Chinook hang over Calgary, but the forecast is for a winter storm warning, with up to 30 cm of snow and temperatures down to -18. The entire atmosphere is so different from where I have just been, I might as well have gotten on a rocket ship and flown to a different planet. Already, the boat sitting in the Bahamas seems like something I might have dreamed. Fortunately, I can Skype back to Sara and the kids, and see that it is real, and sitting right where I left it. It is great that I have worked in Red Deer before, as everything seems familiar, and the stress of working in a different hospital is not as great as it could be. 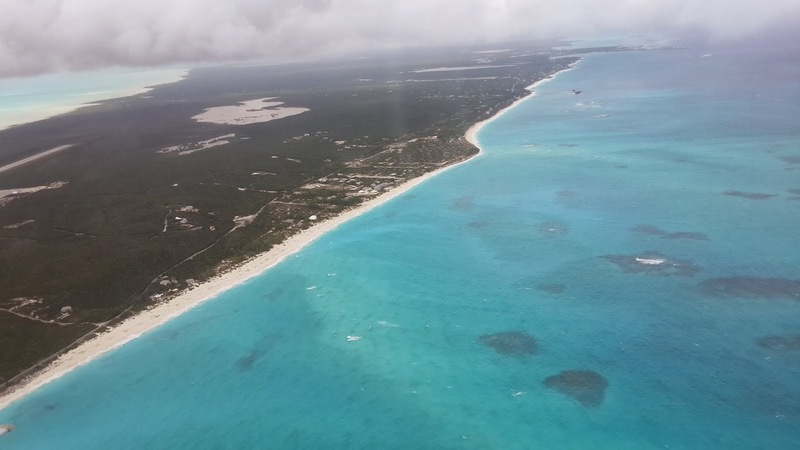 On the flight from Miami to Calgary, I get a little "medical warm-up", when one of the passengers starts to feel unwell, and they call for a doctor over the intercom. Fortunately, it is nothing major, and he starts to feel better quickly. All I really have time to do is quickly assess him. With the help of an ER nurse who also happens to be on the plane, we decide it is nothing serious, so the flight can go on. The flight attendant takes down all my info, and double checks my boarding pass. It will be interesting to know if I hear anything else from West Jet about it. My first day in Red Deer, I go down to the car to get in a quick bit of Christmas shopping before I have to work. The windows are completely frosted over. I'd forgotten about that. Despite the dropping temperature, my body seems to remember how to deal with cold, and I am not too uncomfortable, even though I don't have my usual cold weather jacket with me. It strikes me that dealing with cold is pretty much exactly the same as dealing with the Florida heat in reverse. Straight from the hotel to the car, a bit uncomfortable while the heat gets going, then quickly from the hotel into the mall, where the heat keeps things comfortable. Nobody walks here either. Given that I will be pretty much working and sleeping for the next week, I shouldn't be too bothered by the fact that I don't have my cold weather gear. It's too bad - it might have been nice to get out and enjoy the different weather a bit, but I won't have time for that. 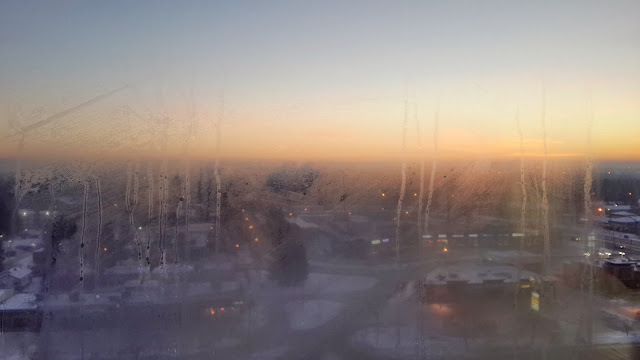 Red Deer sunrise through frosted windows.